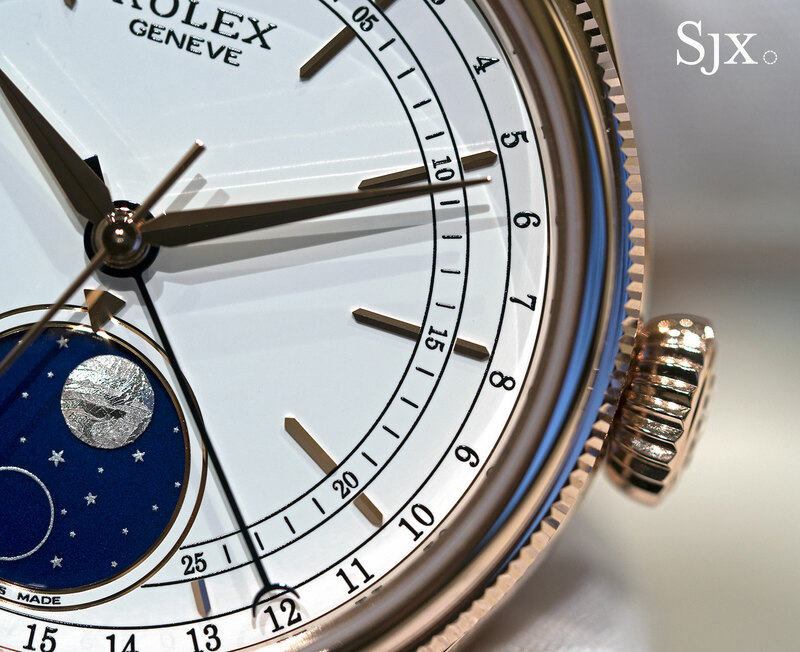 The first Rolex moon phase watch in almost 70 years. 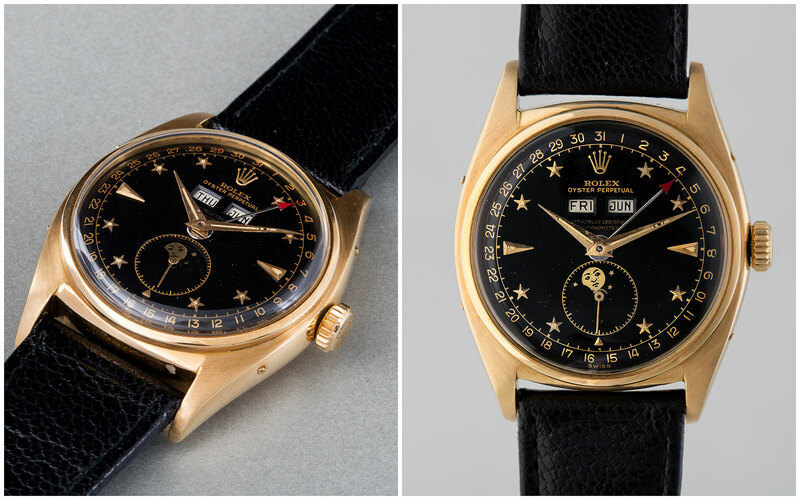 The last time Rolex produced a watch with a moon phase was in the early 1950s, when the references 6062 and 8171 “Padellone” were in production. Now the complication has made a comeback with the Cellini Moonphase, the latest addition to the line that made its debut in 2014. 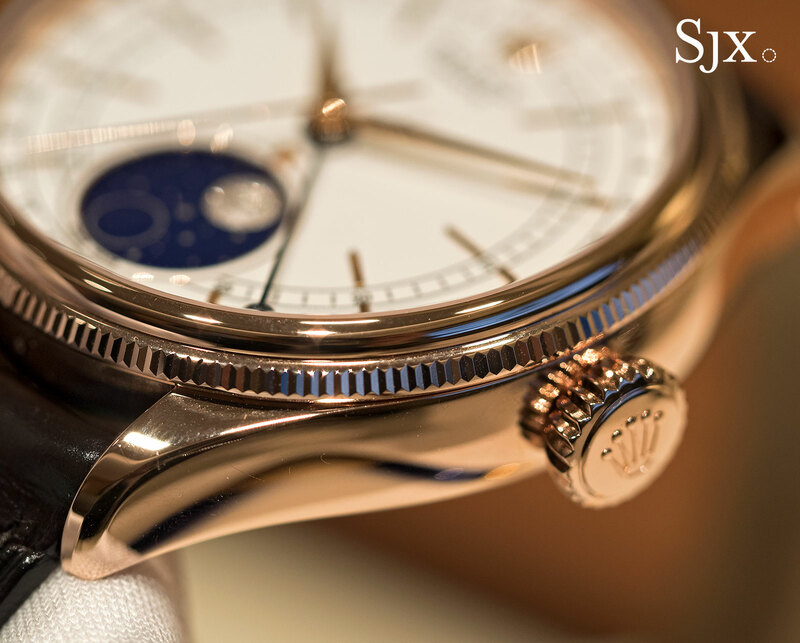 While the inspiration for the new watch is decades old, the Cellini Moonphase looks and feels like a modern watch, or more specifically, a modern day Rolex, which is to say impeccably and precisely manufactured. Combining a moon phase and date pointer, the Cellini Moonphase is visually contemporary with a tiny bit of classical styling. The dial is glossy white lacquer with neat black printing and applied gold hour markers. A railway minute track bisects the hour markers, while the date track sits on the edge of the dial. 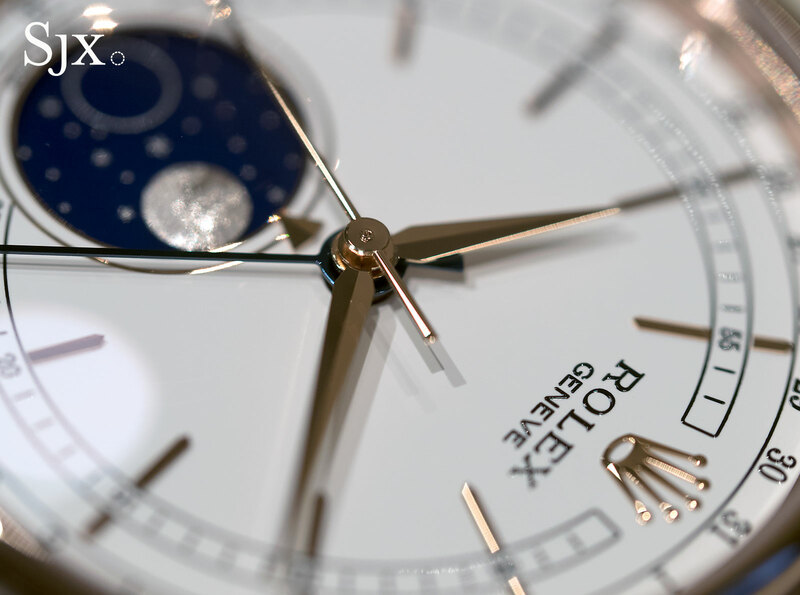 The concentric tracks on the outer edge of the dial give it a somewhat geometric look. 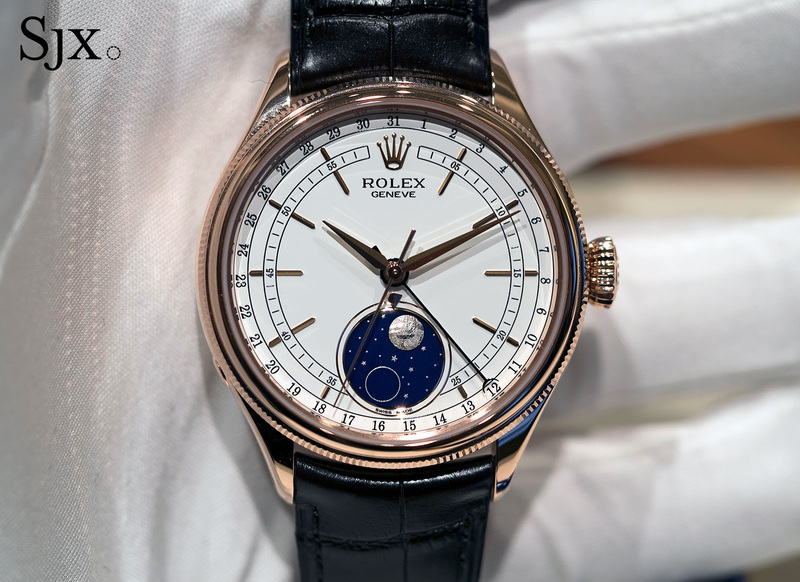 The crescent-tipped date pointer is blued (probably gold rather than steel since the latter oxidises over time and Rolex aims for eternity), matching the moon phase disc. 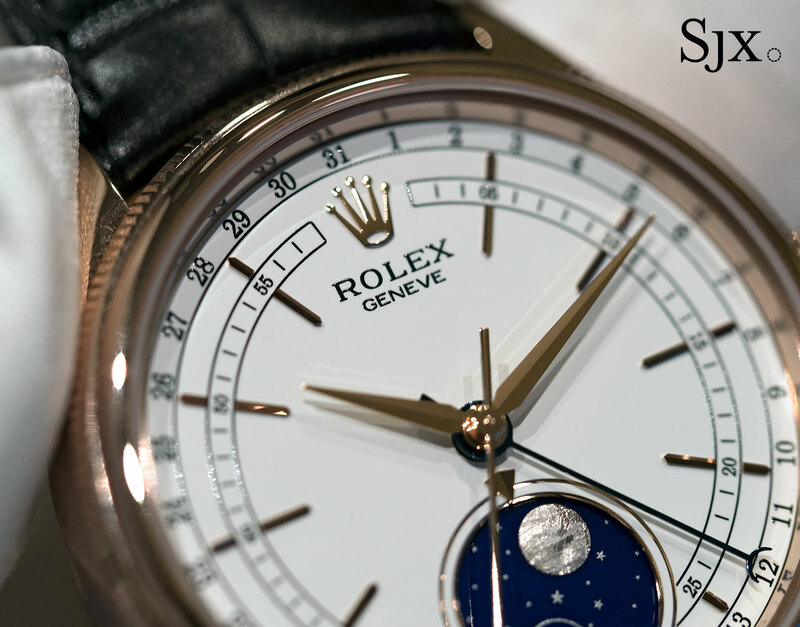 Advanced via a recessed button in the case at eight o’clock, the moon phase is accurate to a day in 122 years, the conventional standard in watchmaking. 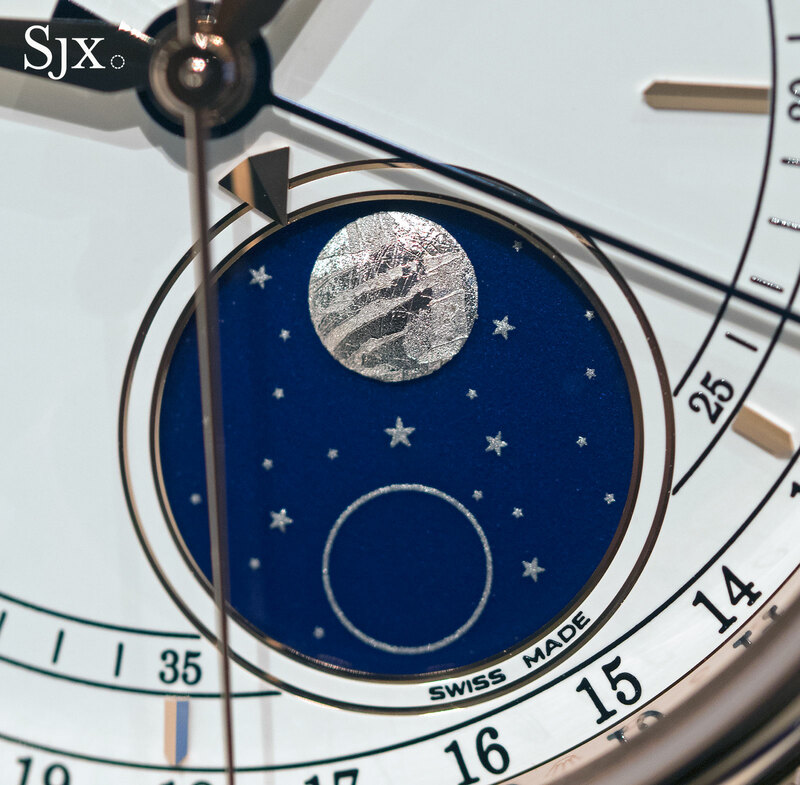 Unusually the moon phase disc is fired enamel, an anachronistic finish for a brand that tends to prize technology. 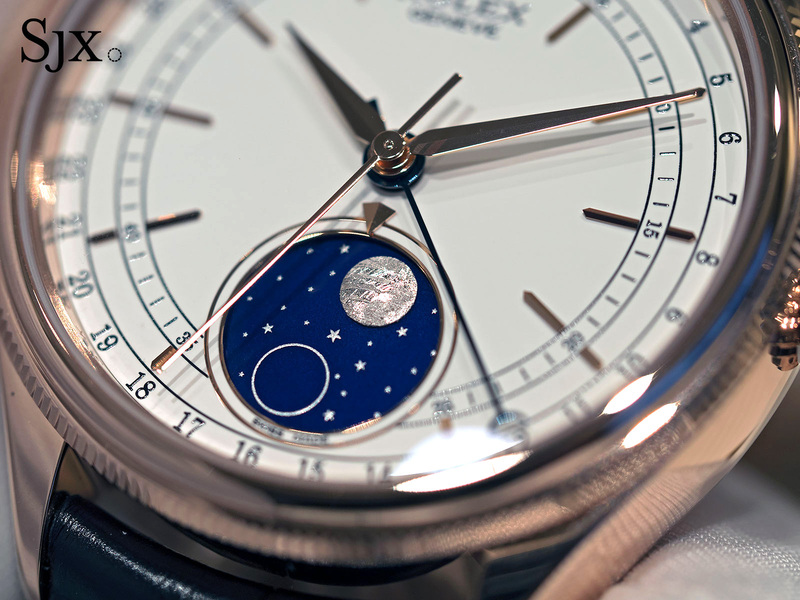 At an angle the uneven, slightly pockmarked surface of the moon phase disc indicates it’s vitreous enamel, rather than just lacquer. It’s the only element of the watch that is not flawlessly produced, which conversely makes it compelling. The new moon and stars on the blue enamel are printed in silver lacquer, while the full moon on the disc, however, is a disc of meteorite that’s been rhodium-plated, explaining the bright white finish. 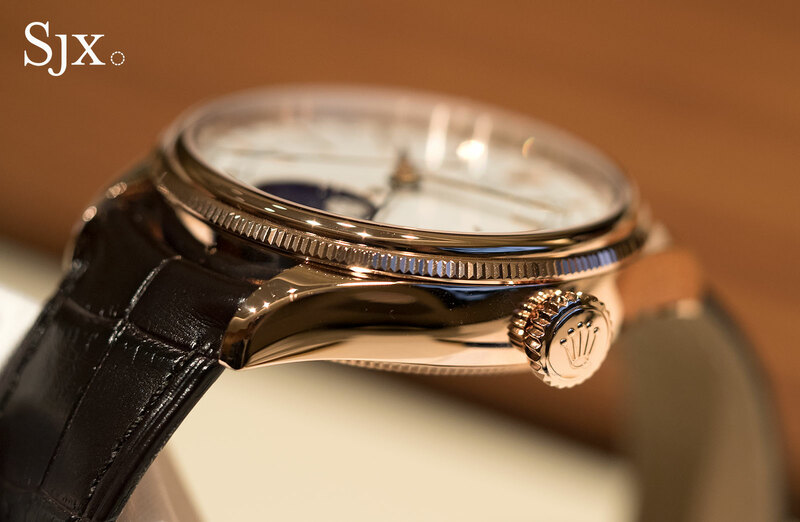 The case is typical Oyster – 39mm in diameter with a fluted back and bezel; the bezel is actually stepped, with fluting on the lower edge. And it’s all in 18k Everose gold, Rolex’s patented rose gold alloy that’s fade-resistant. Though not large, the case is large enough, giving it a reassuring weight in the palm. 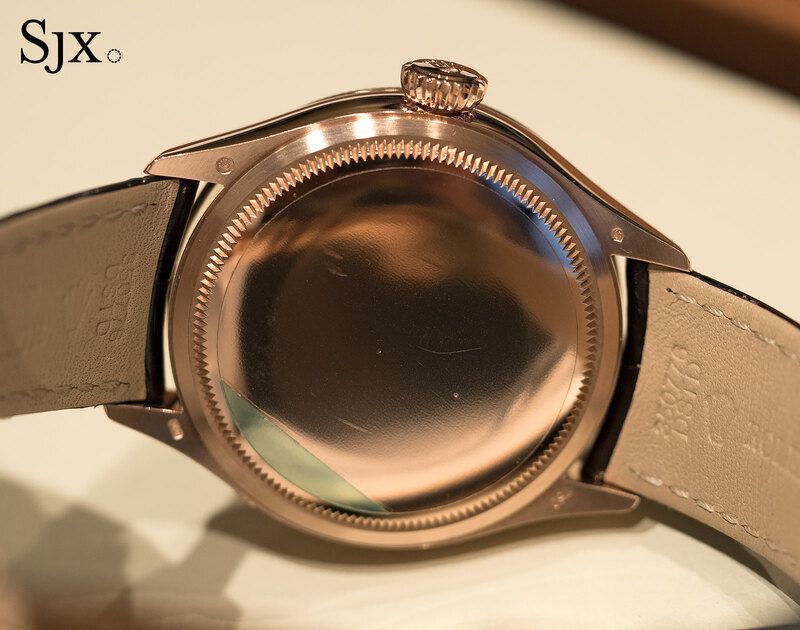 And the strap is attached to an 18k Everose gold Crownclasp, essentially a proprietary Role folding buckle, which further adds to the heft of the watch. Inside is the calibre 3195, a self-winding movement with a 48-hour power reserve and blue Parachrom hairspring. It’s hidden beneath a slightly domed screw-down back that’s typical in shape for the Cellini. 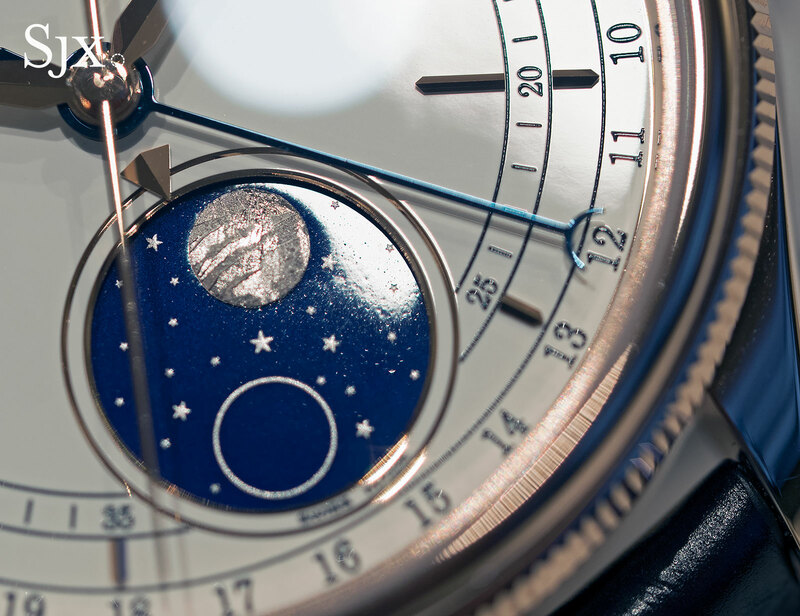 The Cellini Moonphase (ref. 50535) is priced at SFr25,500 or S$35,980, and will reach stores in the last quarter of 2017.